With so many sugary cereals in the ever expanding supermarket cereal aisles, porridge oats are not one that you’ll very often hear them calling out for: at the end of the day, kids are kids, they love sweets, treats, sugar and all things nice, so it’s up to us grown-ups to make porridge exciting! Luckily, porridge has come a long way from the days where it was made in a massive pot (why did it always have to be made in such large quantities!? ), and seen as a basic staple: now it’s incredibly versatile, and can be as plain or as indulgent as your heart desires! So, we thought we’d share these 10 exciting and fun porridge recipes with you so that the next time your kids see porridge oats in the cereal aisle, they’ll want them over the sugar nasties. Once you add maple syrup to anything, kids tend to become a lot more interested in eating it right? This recipe is a winner: not only does it have said maple syrup, it also offers great nutritional foodstuffs in the form of apple and pecan nuts. Perfect for kids and adults alike! Ok, this is very indulgent but hey, it’s perfect for a treat and a great way to make kids love porridge! Just melt a little bit of chocolate, stir it through and you can be sure that your kids will suddenly realise that actually, porridge is quite delicious after all! Cinnamon is perfect accompaniment to a bowl of porridge. But not only does it give a wonderful warming flavour, it also works really well with other toppings too. Like Almonds for example. Yum. As well as being a producer of wonderful oats, White’s oats also produce a delicious jumbo oats granola, in a choice of apple & cinnamon, strawberry & banana, and wild fruit toasted oats toppings. Sprinkle any of these on top of your kids porridge along with blueberries and natural (or other) yoghurt, and they’ll be licking their lips! This one is nice and simple: some fresh greek yoghurt with some honey poured over is truly delicious. And just as with maple syrup, honey is always a big favourite with kids so this one works a treat everytime! Mmm, this one is very interesting and delicious indeed. Add some blueberries, raspberries, and strawberries to a blender. Pour the delicious fresh fruit puree over the porridge, topped with creamy greek yoghurt and some granola. Woah, how delicious is this one?! Get a nice hot bowl of porridge and simply free pour some yoghurt (whatever type you prefer) over it. Then, to make it truly indulgent and deliciously sweet, dollop over a few spoons of strawberry jam / compote and kids and adults alike will be as happy as the day is long! Raisins are a very popular snack with kids; it’s probably the only fruit that they regard as a treat, hence the reason raisin mini snack packs are so popular with kids. So, given that kids see raisins more as a treat than a healthy fruit snack, why not use them as a porridge topping? Try them in combination with chopped apricot and honey and they’ll love it! We’ve already extolled the virtues of cinnamon and maple syrup as a flavour combination, but what about adding some grated chocolate to the top, just to enhance it even further….and make it even more indulgent and kid friendly!? 10. You tell us yours! We wanted to show just how versatile porridge is, as a breakfast cereal. But more than that, we also wanted to offer up some really simple yet incredibly practical recipe ideas to show that with just a little imagination (and let’s be honest, not too much work or effort! 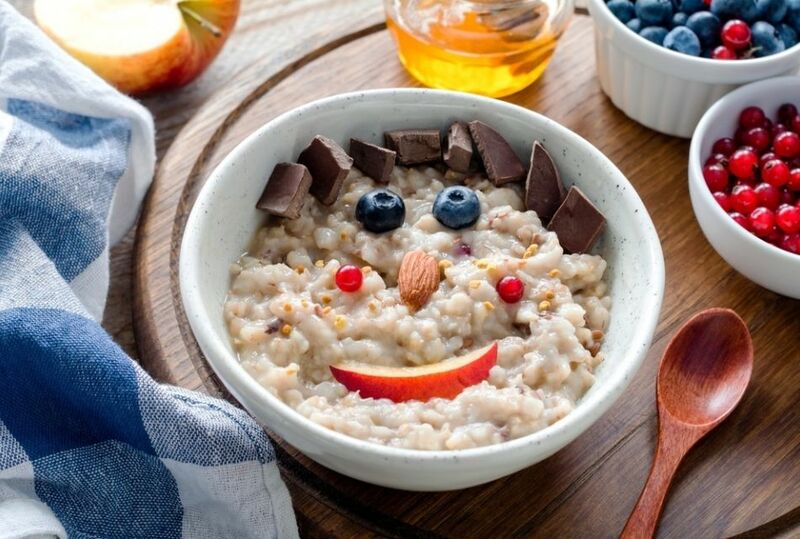 ), porridge oats can be a delicious cereal for kids to enjoy. Now that you’ve read our recipe suggestions, we’d love to hear yours! Because the great thing is, there are so many flavour combinations when it comes to porridge oats, yours might be the very one that gets other kids enjoying porridge oats for the first time!